A voice for Stray, Feral & Abandoned Cats and Kittens, who can’t speak for themselves!! Focus on Ferals is a non-profit, all-volunteer organization, which was founded in 2011, and is dedicated to humanely reducing the feral and stray cat population in Franklin County in Upstate NY through a variety of methods without euthanasia. With our Trap, Neuter, and Return program, feral cats are humanely trapped, evaluated, vaccinated, and sterilized by veterinarians. Adult feral (wild) cats are returned to their familiar habitat with a caregiver. Under our adoption program, the kittens and/or socialized adult cats are temporarily placed with foster families until they can be permanently adopted into good homes. We are a 501(c)3 charity. 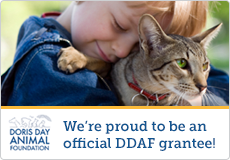 The majority of our monetary donations pay for the cost of our veterinary bills. In 2018 Focus on Ferals took in nearly 300 cats and gave them a warm bed, food, veterinary care, and the care and attention they desperately needed, as well as continuing to look after the cats already in their care and found homes for approximately 250 of them. Many cats spend weeks, months, and sometimes years in Focus on Ferals care getting vet treatment, rehabilitation, training, socialization, food, warmth, and anything else they need to go on to live a happy healthy life. But it can only happen with generous support from the public. Animal lovers can help provide that vital care by donating and helping to deliver kindness to animals this year. We look forward to another success year by helping the homeless felines in our communities, Thank you for your continued support.